For our last day in Copenhagen, we decided to take it easy and enjoyed a long, leisurely lunch at Manfreds, a casual wine bar affiliated with Relae. It happened to be gorgeous out, so we sat at the picnic tables outside and nibbled through the 5 small plates that were part of the “chef’s choice” lunch special. At 175 Dkk ($35), it was a relative steal compared to all the fine dining foraging premiums we had paid the days prior. I was a little worried that the Relae association would mean more strange flowers and herbs in the horizon, but luckily the food here was a little more traditional and accessible. You can’t escape the foraging aspect entirely–they did throw in marigold flowers and pine needles–but these wild herbs were used to lightly season, rather than subvert, the dish. Ruoxi sighed upon learning that the first dish was a plate of carrots–he is clearly more of a meat person. 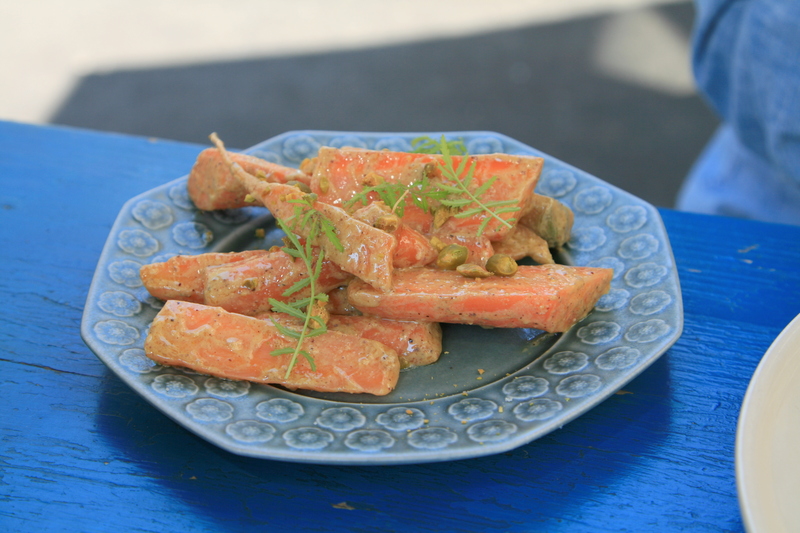 The carrots were nicely dressed in some olive oil and mustard, which helped make the vegetables seem more substantial. The marigold flowers were bright and surprisingly citrus-y, and the golden, nutty pistachios were delicious. This soup was extremely refreshing–a light, cold puree that didn’t rely on tons of cream for some substance and flavor. 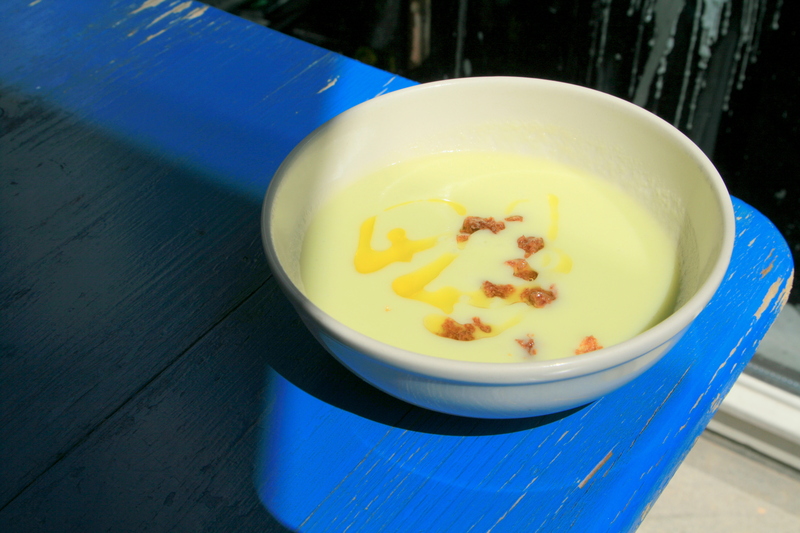 The crispy bread pieces were very crunchy and satisfying, giving the smooth soup some nice texture. 3 dishes in, and still no meat on the horizon! Ruoxi was eating more and more bread by the minute. The summer cabbage and grilled pork was my favorite dish in the chef’s lunch. 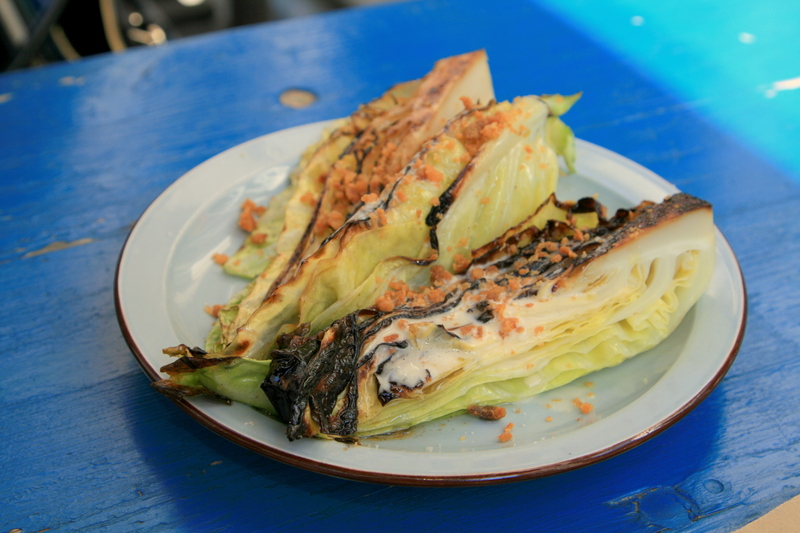 I loved the grilled char along the outer edges of the cabbage, and all the leaves tasted very fresh and crunchy. The mild, creamy dressing was very pleasant, and the crisp, rich pork nuggets were fantastic. We surprisingly did not come across any eggplants in Copenhagen until today. Our first encounter was a very pleasant one. 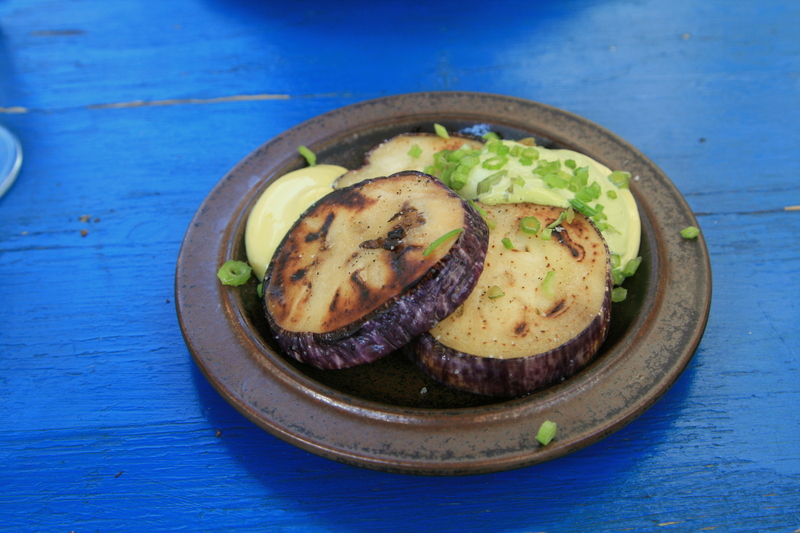 The roasted aubergines were very plump and substantial, and the decadent herb creme sauce emphasized the heartiness of the vegetables. …and finally, a proper meat dish! A plate full of venison in venison sauce and sprinkled with pine. Only it was extremely gamey. I felt like I was eating dense venison liver full of iron. The pine needles did nothing to help offset the wild flavors. Needless to say, most of the venison went uneaten. After 4 small vegetable plates and an unsatisfactory meat dish, we decided it was necessary to add on the beef tartare. 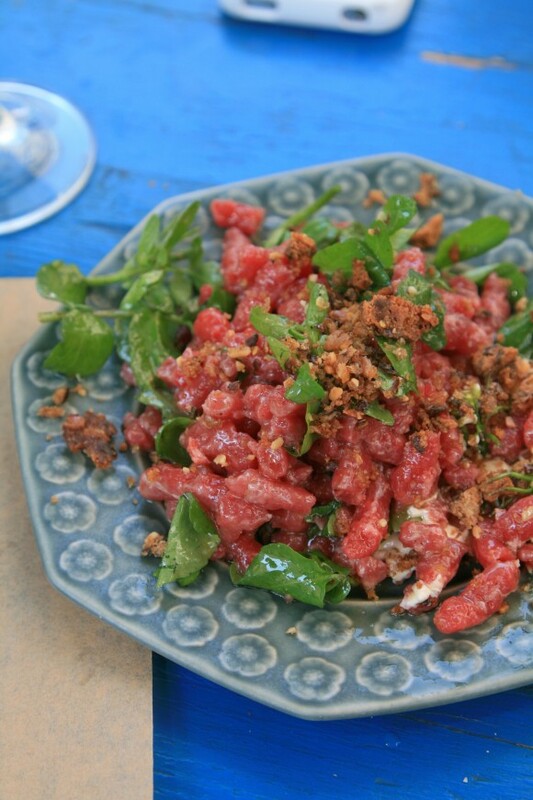 It was the right call, because the tartare was brilliant. 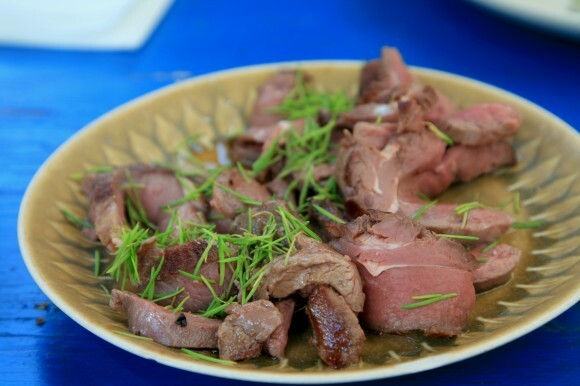 The meat was in such fine shape–a pinch of salt and pepper was all that was needed to bring out the flavors, which was on par with anything cooked. The thick layer of creamy horseradish sauce was so rich and rewarding, while the bread crumbs and watercress helped keep the richness in check. If you’re keen to do the wine pairing, just note that Manfreds tends to choose wines with “natural” characteristics. You’ll taste volcanic ash, granite and all types of terrain in each sip, but it goes very well with the meal. We were satiated and slightly buzzed by the end, and we took a moment to savor our food coma, since we were in no hurry to leave this wonderful city.